Economists insist that recovery is at hand, yet unemployment remains high, real estate values continue to sink, and governments stagger under record deficits. 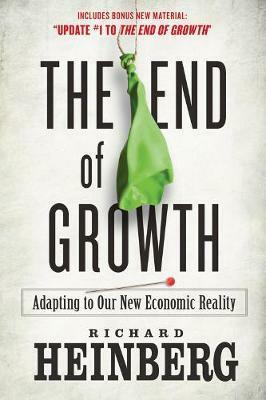 "The End of Growth" proposes a startling diagnosis: humanity has reached a fundamental turning point in its economic history. The expansionary trajectory of industrial civilisation is colliding with non-negotiable natural limits. Richard Heinberg's latest landmark work goes to the heart of the ongoing financial crisis, explaining how and why it occurred, and what we must do to avert the worst potential outcomes. Written in an engaging, highly readable style, it shows why growth is being blocked by three factors: resource depletion; and, environmental impacts and crushing levels of debt. These converging limits will force us to re-evaluate cherished economic theories and to reinvent money and commerce. This book describes what policy makers, communities, and families can do to build a new economy that operates within Earth's budget of energy and resources. We can thrive during the transition if we set goals that promote human and environmental well-being, rather than continuing to pursue the now-unattainable prize of ever-expanding GDP. Richard Heinberg is the author of nine previous books including The Party's Over, Peak Everything, and Blackout. He is a Senior Fellow of Post Carbon Institute, a think tank helping chart humanity's transition from the brief, waning reign of fossil-fueled megatechnology to the dawning era of re-adaptation to nature's limits. Widely regarded as one of the world's foremost Peak Oil educators, Richard lectures widely and appears on radio, television, and in films. With a wry, unflinching approach, he explains the trends that shape our world.